Ligand fishing is a widely used approach for screening active compounds from natural products. Recently, cell membrane (CM) as affinity ligand has been applied in ligand fishing, including cell membrane chromatography (CMC) and CM-coated magnetic bead. However, these methods possess many weaknesses, including complicated preparation processes and time-consuming operation. 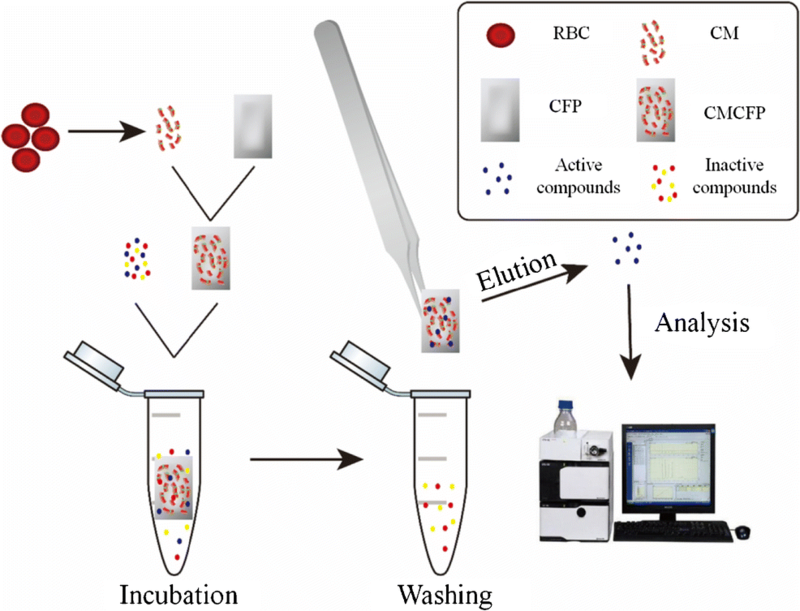 In this study, cheap and easily available cellulose filter paper (CFP) was selected as carrier of CM and used to fabricate a novel CM-coated CFP (CMCFP) for the first time. The type of CFP was optimized according to the amount of immobilized protein, and the immobilization of CM onto CFP by the insertion and self-fusion process was verified by confocal imaging. The CMCFP exhibited good selectivity and stability and was used for fishing potentially active compounds from extracts of Angelica dahurica. Three potentially active compounds, including bergapten, pabulenol, and imperatorin, were fished out and identified. 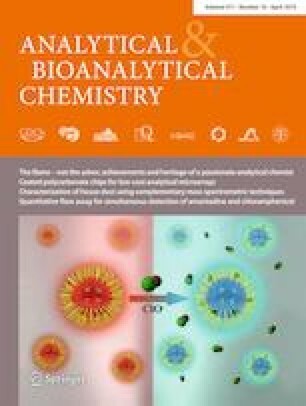 The traditional Chinese medicine systems pharmacology database and analysis platform was used to build an active compound-target protein network, and accordingly, the gamma-aminobutyric acid receptor subunit alpha-1 (GABRA1) was deduced as potential target of CM for the active compounds of Angelica dahurica. Molecular docking was performed to evaluate the interaction between active compounds and GABRA1, and bergapten was speculated as a new potentially active compound. Compared with other methods, the fishing assay based on CMCFP was more effective, simpler, and cheaper. Liang Xu and Cheng Tang contributed equally to this work. The online version of this article ( https://doi.org/10.1007/s00216-019-01662-z) contains supplementary material, which is available to authorized users. We would like to thank Prof. H. Duan of Tianjin Medical University and Prof. L. He and Prof. S. Wang of Xi’an Jiaotong University for their valuable help on this work. This work was financially supported by the National Natural Science Foundation of China (Grant Nos. 21605114, 81402889, 81303191), 131 innovative talents training project in Tianjin, Tianjin Municipal Administration of Traditional Chinese Medicine (Grant No. 2017077), and Tianjin Institute of Higher Vocational Education (Grant No. VII308). The procedure about rabbit was approved by Animal Ethics Committee, Tianjin Medical University, Tianjin, China. All the experiments on rabbits were performed in compliance with the guide of care and use of laboratory animals.